Bring the quinoa and veg broth to a boil. Cover, reduce heat to medium-low, and simmer 20 minutes, or until all liquid is absorbed. Saute the onion and sun-dried tomatoes for 4 minutes, or until onion has softened. 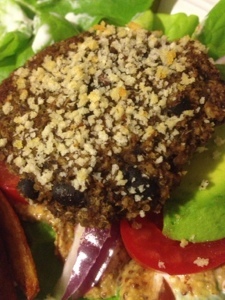 Stir in 3/4 cup black beans, garlic, steak seasoning, liquid smoke, and 11/2 cups water. Simmer until most of liquid has evaporated. Take all that jazz to your food processor, add 3/4 cup quinoa and blend it up. Uproot from the processor to a mixing bowl and add in the remaining quinoa, panko, and remaining black beans. Bake 20 minutes, flip, and bake 10 minutes more. 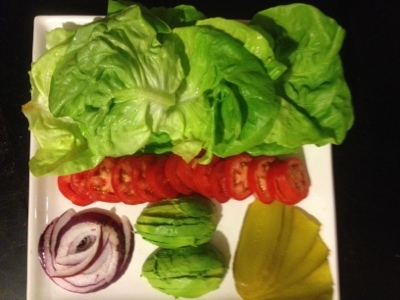 Serve in a lettuce wrap, or on buns, with your favorite fixins'. 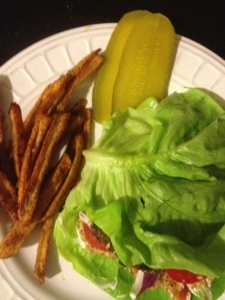 I ate mine wrapped in butter lettuce and had some oven baked fries on the side....delish. I love this recipe, I am going to try this. Never made it with the quinoa....bet it is great. Thanks! Don't forget to get back to me on your thoughts. I love to hear what y'all think of my dishes. I love this recipe! It's my go to for a meat free burger. It's full of flavor! yay! that makes me so happy. thanks for making my monday awesome!